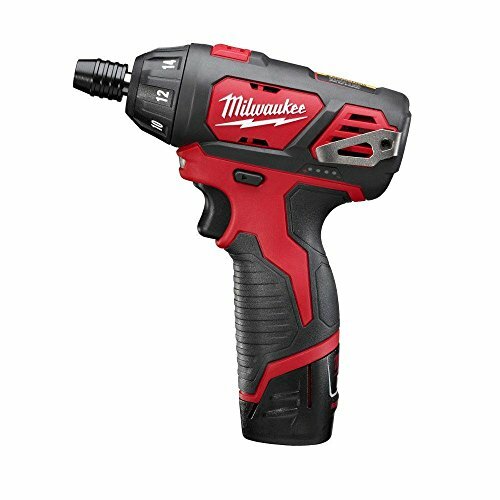 The M12 12-Volt Lithium-Ion Cordless 1/4 in. Hex Screwdriver is great for driving a variety of common small fasteners. Delivering 175 in. lbs. of torque, it's powerful enough to drive one-hundred-thirty 3 in. screws in a single battery charge. Its lithium-ion technology supports full-day run time on the job. And, for even more job site functionality. This screwdriver features a metal gear case for durability and an LED light to illuminate dark spaces. You'll never have to miss valuable working hours. Includes one M12 cordless lithium-ion screwdriver, two M12 REDLITHIUM batteries, one M12 lithium-ion battery charger and one contractor bag. Variable-speed trigger for increased control. Quick-change keyless 1/4 in. hex chuck for easy 1-handed bit insertion and removal. Ergonomic and compact design for fitting comfortably in tight workspaces as well as a pocket or on a tool belt. Lightweight at only 2.2 lbs.